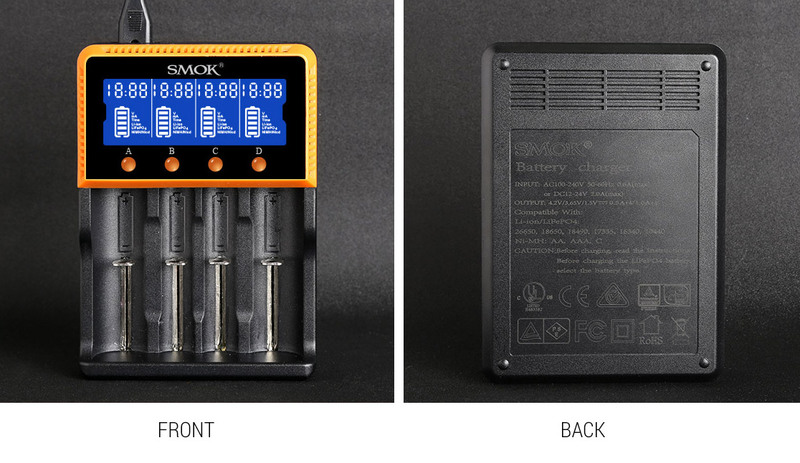 Charger - SMOK® Innovation keeps changing the vaping experience! 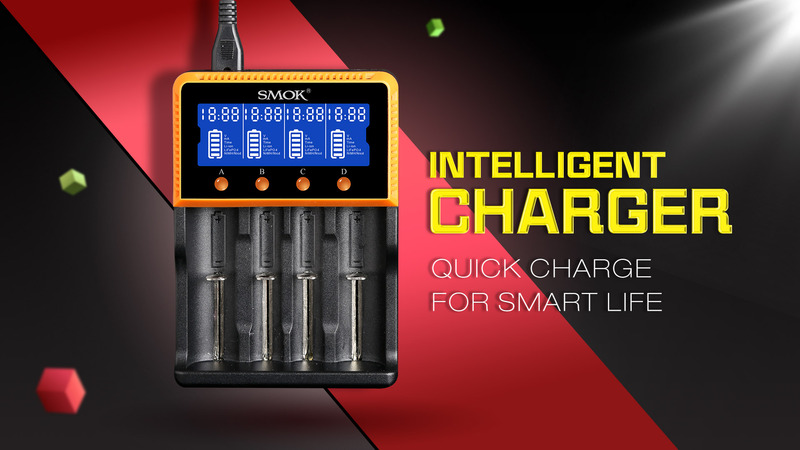 The newest smart charger will provide you with endless power which comes from SMOK, it also has high portability. Meanwhile, the 4-slot allows high-speed charging. Besides you can get the charging state from the clear LCD screen and enjoy easier vaping life. Just enjoy it with the smart charger! Broad spectrum of Li-ion, Li-FePO4, Ni-MH, Ni-CD, rechargeable cell size. Charger battery, select of LiFePO4 battery. Support 500mA current and 1000mA current charging. 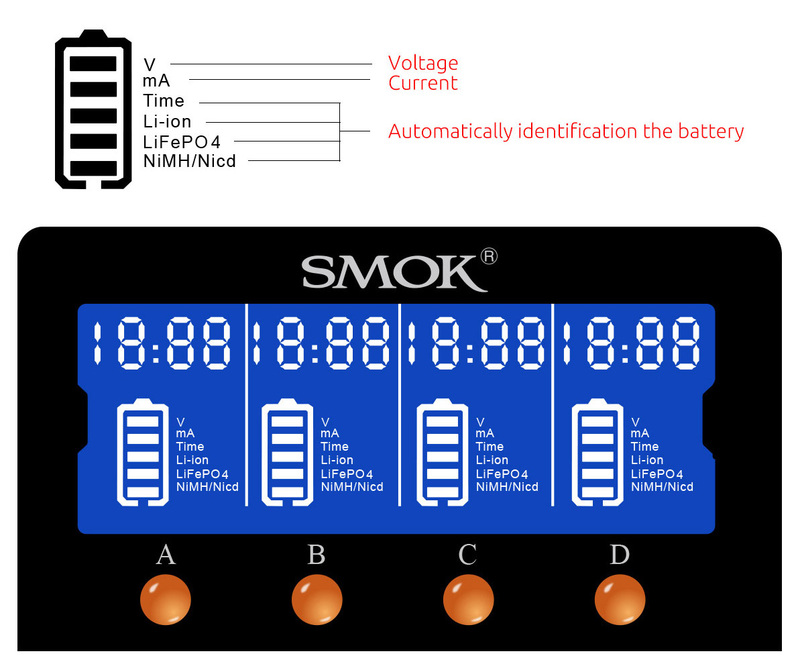 LCD display of each cell’s voltage, charging current, charging time and battery type. It supports both AC and DC wide supply voltage, can use in the vehicle. Advanced protection against short circuiting, over-current, overcharging and wrong polarity direction. If the battery over-charged/battery voltage low, with low current activation function to protect the battery. Charging over 8 hours will be automatically stopped to ensure safety. Compliant Standards: TUV, GS, PSE, FCC, CE, C-TICK, CB, RoHS. The Intelligent LCD screen will display voltage, charging current, charging time and battery type of each battery slot. The charger will automatically off for energy saving without operation after 30s. For your protection and that of the cells being charged, used the charger only as instructed. Discontinue use if the battery contacts, cord or the charger are dropped or damaged in any way. Disconnect the power supply when charging is completed. Do not attempt to charge with AC and car power sources at the same time. Under no circumstances should the charger be dismantled modified or used for other purposes. As an electrical appliance, keep the charger out of reach of children. Using damaged batteries represents significant risk and voids the provides the product’s warranty.